This Multifunctional Backpack Harness Shoulder Strap allows you take all your DJI Phantom Kits for a short trip. It can easily carry your DJI Phantom outdoors, Comfortable for wear, Flexible Adjust, one Size fits all. Appliance Assemble: Drone(with battery), a specific battery jockey position, 4pcs paddle specific jockey postion, remote controller strap. Also This Backpack Harness Shoulder Strap have a Remote COntroller Strap, prevent your Remote Controller from drops. P.KU.VDSL Satisfaction Guaranteed -- We are so confident in the quality of our product that we offer a 45-day satisfaction guarantee! If you are unsatisfied, simply contact us to return the product for a full refund. 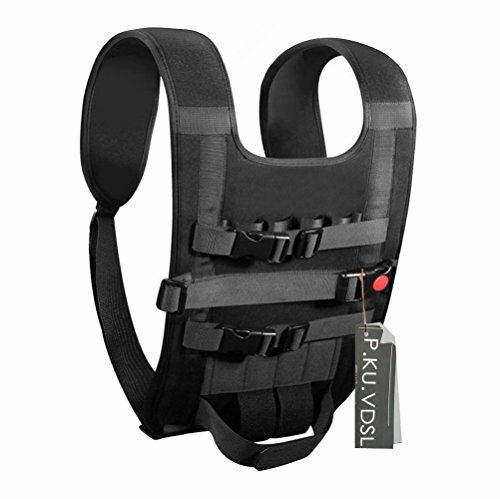 ★ HIGH QUALITY -- P.KU.VDSL Light Carrying Vest. Material: Neoprene Body + Nylon Strap + Elastic Polyester Fibre + ABS Buckle. Designed and Shaped to fit Perfectly Around Your Shoulder, The Weight of your Phantom and Accessories are Evenly Distributed for the Ultimate in Comfort. Adjustable, One Size Fits All. ★ HASSLE-FREE INSTALLATION -- Easy Backpack Carrying Case, Wear Assembly Is Simple and Fast, Suitable for Light Travelling, Quick Release Removable Strap for Transmitter, Made from High Quality Ballistic Nylon with 9mm Padding for Extreme Durability and Comfort. Easy to carry for a short trips, Flexible Material comfortable to wear. ★ SUITABLE FOR DJI -- Compatible for DJI Phantom All Series Phantom 1, Phantom 2 Vision Vision+ FC40, Phantom 3 (Professional / Advanced / Standard) Quad, Phantom 4. ★ CARRY AVAILABLE -- 1x Phantom Quad, 1x Remote Controller,1x battery, 4x Propellers, Suitable for Short Trip Outdoor. Package Included: P.KU.VDSL Easy Carry Vest / Shoulder Strap for DJI Phantom Series (Quadcopter & Spares for Display Only, Not Include for Sale). ★ P.KU.VDSL GUARANTEED -- We are so confident in the quality of our product that we offer a 45-day satisfaction guarantee! If you are unsatisfied, simply contact us to return the product for a full refund. (NOTE: Product Image 100% In-Kind Shooting, It Is Normal That The Color cause a Little Different Due To Production Batch or Ambient Light And Different Display Resolutions). If you have any questions about this product by P.KU.VDSL, contact us by completing and submitting the form below. If you are looking for a specif part number, please include it with your message.